Sometimes you come across a recipe that, just by the ingredients, you know is going to be bad news — as in bad news for your hips, bottom, cholesterol, arteries or all of the above. Unfortunately, from my limited life experience, I've found that these dishes are also the ones you just can't resist, and your fork keeps going back for more and more. And this, my friends — with all the gooey, chocolatey, nutty goodness you see pictured above — is one of those recipes. 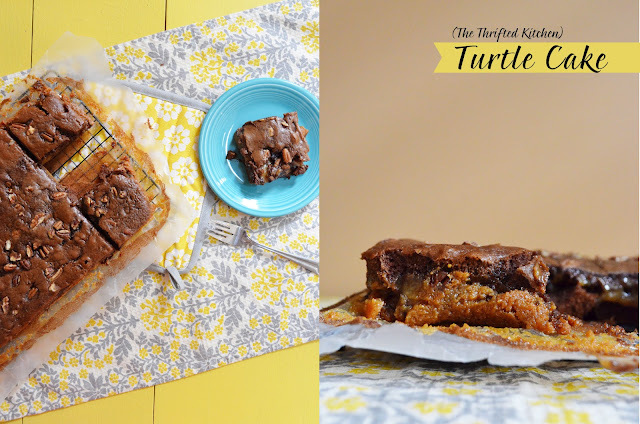 It's called turtle cake, and I plucked it from a stack of old recipe cards I thrifted last year. These cards, plus loads of others I've picked up, have finally reached a point where they were screaming to be organized, so I've been going through and weeding out the meat-centered ones (sorry, hubs) and setting aside the special ones I think you guys might like to see on here some day. Let me just warn you about two things when it comes to this turtle cake: 1) It's really easy to make, especially since it uses cake mix, and 2) It's one of those pour-me-a-giant-glass-of-milk desserts. So when you find yourself making this over and over again and then see an increase on the milk portion of your grocery bill, don't say I didn't warn you. The only addition I made to the recipe itself was an extra helping of chocolate chips and chopped pecans on top...you know, for good measure. :) So give it a try and, when you come out of that chocolate coma, let me know how you liked it! Preheat oven to 350 degrees and grease a 9 x 13 glass cake pan. Prepare cake according to package directions, and pour half the batter into prepared cake pan. Bake for 15 minutes. Refrigerate remaining batter while first half bakes. Combine evaporated milk, butter and caramels in a saucepan and melt together over medium-low heat. Stir frequently so caramels don't burn to bottom of saucepan. Removed cake from oven after 15 minutes and pour caramel mixture on top. 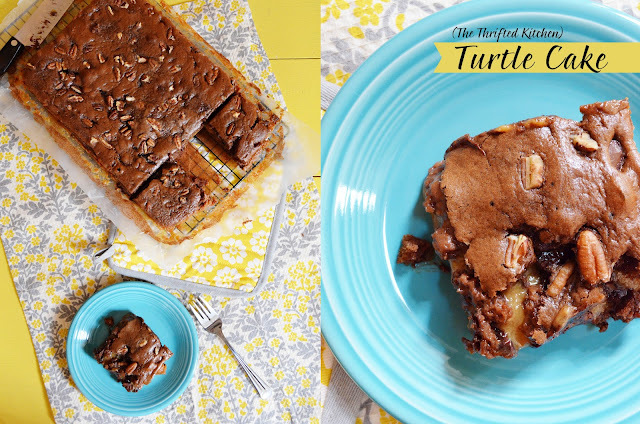 Layer chocolate chips and pecans on top of caramel, then top with remaining cake batter. If using, sprinkle additional chocolate chips and chopped pecans on top of cake batter. Bake for another 20-25 minutes. Let cool on wire rack for 10-15 minutes before serving. Heck yes! This looks so freaking good. I am trying to pretend chocolate doesn't exist since I am on a bit of a health kick, but then I see something like this and it is not so easy.